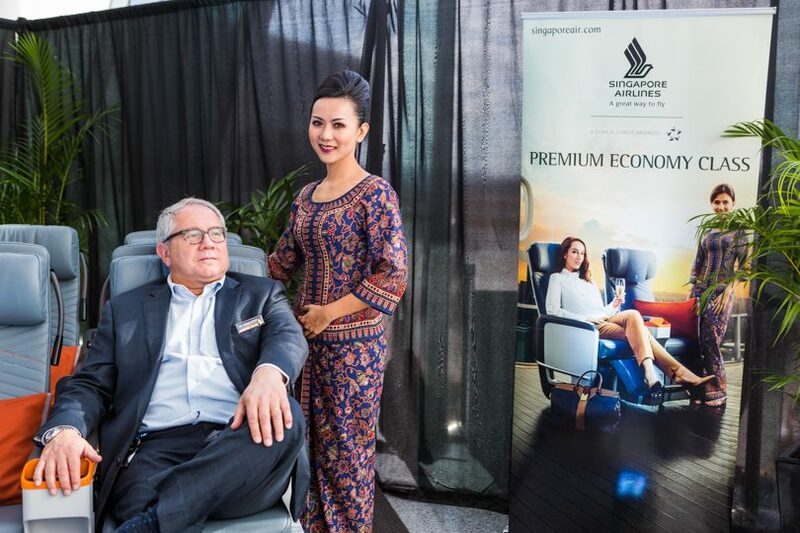 From Wednesday to Friday last week, visitors to Canberra International Airport had no need for a passport with Singapore Airlines showcasing their Business and Premium Economy seats in the foyer of the terminal. Photos: Jack Mohr Photography. If you fly in First, Business or Premium Economy Class, you can ‘Book the Cook’ and open up a world of culinary delights. To get the word out on the great new seating options for flying direct to Singapore, Singapore Airlines has had on display at Canberra International Airport their new premium economy and business class seats. In fact, the Boeing 777-300ER jets have 264 seats – including four First Class, 48 Business Class, 28 Premium Economy and 184 Economy Class seats. “We are excited to bring the Premium Economy option to Canberra. No other airline has premium economy internationally out of Canberra. It’s a great fit for the Canberra market,” Singapore Airlines Area Manager NSW and ACT, Greg McJarrow said. “Our Business Class seat provides every customer with direct aisle access, thanks to the 1-2-1 configuration, with every seat transforming into a fully-flat bed,” Greg stated. From Wednesday to Friday last week, visitors to Canberra International Airport had no need for a passport, with Singapore Airlines showcasing their Business and Premium Economy seats in the foyer of the terminal. Potential customers had the chance to sit, stretch out and lie in the ‘Next Generation Cabin Products’. To showcase all the comforts of the seats, four of Singapore Airlines’ famous Cabin Crew were on hand to help people experience the seats. No passport? That wasn't a problem for visitors to Canberra Airport last week, who got to experience Singapore Airlines' Business and Premium Economy seats in the foyer of the terminal. Potential customers had the chance to sit, stretch out and lie in the ‘Next Generation Cabin Products’. We were there to capture all the action. Didn’t manage to get down to have a look? No worries, we’ll tell you what you missed and give you some insight into Singapore Airlines’ First and Economy Class seats as well. If you want to travel First Class direct from Canberra to the rest of the world, then Singapore Airlines is your only option. So, what do you get in First Class? Treat yourself in one of four First class seats. Book the Cook– Reserve your main course up to 24 hours before you fly, including creations by notable chefs from Singapore Airlines’ International Culinary Panel. Dine in restaurant setting onboard with full table service, and wines to match the food and altitude. Now with 48 business class seats on each flight out of Canberra. Singapore Airlines Business Class seats convert to a full flat bed. Now enjoy 28 Premium Economy seats out of Canberra on Singapore Airlines. Manager ACT Singapore Airlines, Hugh Chevrant-Breton and one of Singapore Airlines’ famous Cabin Crew demonstrating the Premium Economy seats our of Canberra. Priority Treatment – From check-in to boarding and baggage handling, enjoy priority treatment throughout your journey, including a generous 35kg of checked baggage and Champagne throughout the flight. The 184 seats in a 3-3-3 layout in Economy provide customers with an 18.6-inch wide seat, personal 11.1-inch touchscreen monitor, new backrest cushion comes with bolstered sides for better back support , adjustable ergonomically sculpted headrests, a personal non-intrusive reading light and the chance to enjoy a selection of Asian and International dishes while you relax to one of the 1,000 plus entertainment options on the KrisWorld in-flight entertainment system. So, there you have it, Singapore Airlines is continuing to show its commitment to the region by leading the pack on the standard, and range, of seating available on their international flights, daily, out of Canberra. What is the most important aspect of seating when you travel internationally by air? Those seats are not new. New to Canberra yes, but the product was first fitted to New build SQ 777-300ER’s about 4 years ago and then progressively retrofitted to the remaining -300ER’s. A mighty improvement over the regional seat on the -200 aircraft SQ used to fly here which is no surprise considering this is the long haul product.